As informed earlier, our next SINCA session is scheduled on Friday, February 22 at British Chamber of Commerce in Akasaka. Due to the regulation at BCCJ, we will start the session at 18:00 earlier than usual. We will go right into YOUR ideal society 5.0. We will ask you to draw pictures etc. of YOUR ideal society. 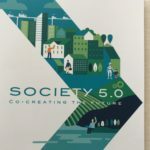 It will be followed by the brief presentation by Ms. Naoko Ogawa, Senior manager of Keidanren, who led the preparation of the report “Society 5.0-Co creating the Future” which was published late last year. For details and registration of the session, go to this site. We will start Yoko’s bar for the people who participated in SINCA /DEX sessions soon. So stay tuned. The session at BCCJ will end at 20:00 due to regulations, but networking session where we can continue informal casual discussion at Ark Hills Cafe nearby. This is optional and separate fee of 2000 yen incl. food & one drink. I hope many of you join networking, too.